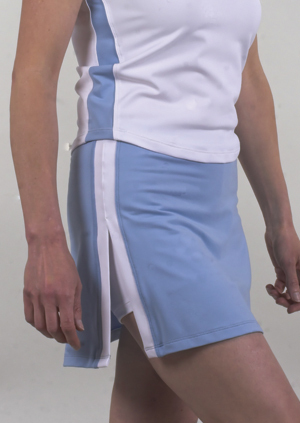 Our ever popular Aida Tennis Skirt, shown here in bluebell with white undershorts. It is a really flattering fit but is also very comfortable to wear. It is a skort so has built in shorts, shown here in white which pick out the matching colour of the side seam stripe. Elasticated waist and side split on each side. Available in 6 other colourways including navy, white with diffferent colour shorts and bubblegum pink. The shorts provide comfortable support and a sleek silhouette, and the super soft fabric gives a fluid movement over the top. Wear the Aida Tennis Skorts with the sleeveless Aida Tennis Tops in the same colourways, or if you prefer a top with sleeves, the Short Sleeve Tee goes beautifully with the coloured skirts. The Cap Sleeve Polo teams well with the white Skorts (shown here in bluebell with white skirt/blue shorts) and we also do a pale pink polo with white skirt/pale pink shorts which looks lovely. We think the sleeveless Susanna Tops, which are a slightly more relaxed fit than the Aida Tops also go really well with the White Aida Skorts. Aida Skirts are available in sizes S ( 8-10), M (12), L (14), XL(16), XXL (18-20). Not sure of your size? Take a look at our sizing page which gives exact waist and length measurements. If in doubt, we suggest you order the bigger size in the Aida range as we think they come up slightly small - or you can always order both sizes and return the one that isn't suitable as we will pay all postage on your returns (within 10 days).